Chevrolet's Volt has only been on sale for a short while but sales are respectable and Chevrolet have pulled out all the stops to build a quality product and bridge the technology gap between the vehicles that everyone is used to and the new generation of electric cars. In Europe, General Motors' brand Opel is planning to do essentially the same thing with essentially the same vehicle, and Chevrolet will be selling the Volt alongside it. The 2012 Opel Ampera is a Volt by any other name, but don't be fooled into thinking the two cars are identical. AllCarsElectric was able to compare the production versions of each vehicle at the 2011 Geneva Motor Show and though the differences are subtle, they do exist. The most obvious difference is the styling. The Volt was the first to make an appearance to the public and adds an extra futuristic appearance to Chevrolet's usual design cues. It's both clearly a technological car, and clearly a Chevrolet. The Ampera is a little different. It looks like no other current Opel, even at the front end where the grille is much smaller than on other Opel products and the deep cut-outs for the lights define the shape. Opel's car looks more distinctive at the front than the Chevrolet and that theme continues as you move from front to back. The Ampera wears more stylized alloy wheels as standard and the side skirts are body-colored rather than black plastic. The rear end looks a little more classy too with a thinner light strip and a dash of chrome, and there's a dose of aggression with a large cut-out in the rear bumper. Inside, the differences are less obvious. The basic architecture is the same with the large gear selector set into a space in the dashboard when in park and two digital display screens providing information for the driver. Even the graphics on the screens looks very similar. The steering wheels are little different, and the four seats appear to be the same shape, with minor differences in trim. The only clear difference is the interior ambience - Chevrolet's use of an Apple-like white finish makes the cabin a little brighter than that of the Opel, which in the trim level on display looked a little dark inside with a gray finish to the dash. Again, this perhaps reflects the Opel's more Germanic and classy image, but the Chevrolet had the more inviting cabin as a result. Mechanically the two cars are essentially the same. They use the same battery pack, the same motor, and the same range extending engine. The platform architecture is shared between the two cars and they should feel more or less the same to drive. Again, the differences are more subtle. We asked Opel how the car differs from the Volt, and the response was interesting. A feature offered on the Ampera and not on the Volt is that of an EV charge-holding option. What this means is that in the Opel, you can delay using the EV mode until such a time as it suits your route. You can begin your journey with the range-extending engine providing the power, but should you then reach a city that (in Europe, particularly) might have restrictions on non-EVs, and cruise around the city using only the EV power. This also means that should you have a longer commute, you're using the EV mode in the most logical manner, where local emissions are more important and the approximate 40 mile EV range will last a lot longer than it would on a freeway. The mode has clearly been a decision of Opel based on how Amperas are likely to be used in Europe, though it wouldn't surprise us to see Chevrolet implement it in due course as it looks like being a very useful feature. We asked Opel what the price difference would be between the European market Ampera and the European market Volt, and the answer is about 1,000 Euros (about $1,400). This will mainly be down to trim level differences, though the benefit of that charge-holding option will likely be of use to buyers too. There is still a large difference in price between the Ampera and Volt available in Europe and the Volt on sale in the U.S, though this can be explained in part by where all the vehicles are produced - initially at least, the European Volt and Ampera will have been produced in Michigan and imported (the Ampera then receiving a battery control module developed by Opel itself). There are plans to produce the Ampera in Europe in the future. 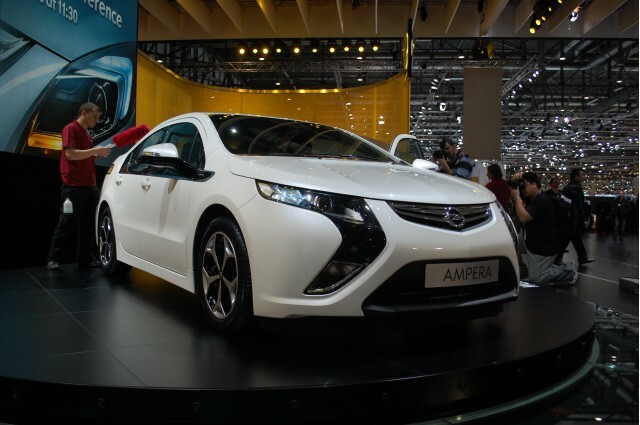 The Ampera should go on sale at around 42,900 Euros, which is about $59,900 at current exchange rates. This price is the German figure, and includes the sales tax or 'Value Added Tax' that many European countries pay on products. The U.S. Volt in comparison starts around $41,000. Both prices are quoted before governmental and local incentives that may lower the price. Some European countries will be able to apply for a rebate of up to 7,500 Euros ($10,500). So similar and yet so different, it'll be interesting to see whether the Volt or Ampera comes out on top in Europe, and whether either can persuade people to part from their significantly cheaper and still highly efficient diesel cars.